Have a clear height space of 4 metres plus? Need to increase your storage space, or office area without moving premises? With our extensive experience in surveying workspace, we can advise on the best Mezzanine solution. Expansion in storage, or office capacity can be achieved with a Mezzanine Floor. 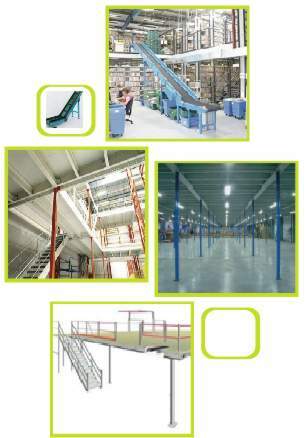 We provide cost saving Mezzanine Floor storage space solutions to business, & warehouses throughout the UK. Our Mezzanine Floors are designed and built to meet the needs of your business, giving you a raised storage area where optimal use of space ensures your business can grow. JJ Storage Systems can help with business space demands, using quality built storage solutions to meet a demanding warehouse environment. We can assist in business storage solutions with warehouse consulting, planning, execution, & finally installation of Mezzanine Floor storage systems that are built to last, & meet the tough standards set by your company. Our advice to customers can sometimes mean re-locating is not needed, saving those all important budgets. We often have Recycled Mezzanine Floors please call we may have one in stock to suit.